Posted on 01/31/2019 by Mark Caicedo	in Interview and tagged Chris Slusarenko, Comet Ping Pong, Eyelids, Interview, power pop. 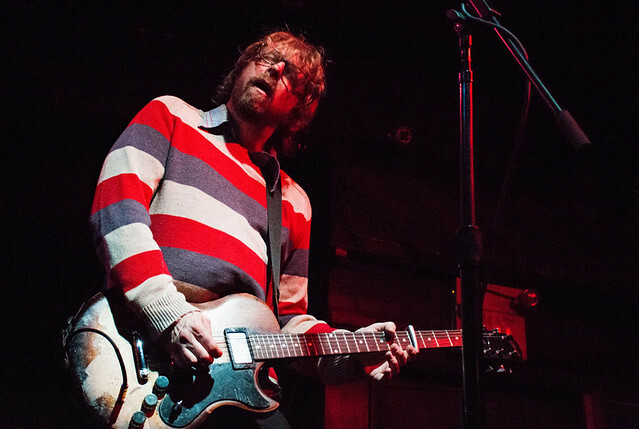 Mark Caicedo of Parklife DC caught up with Chris Slusarenko, frontman of Portland-based power pop band Eyelids, prior to the group’s performance at Comet Ping Pong on Monday, Feb. 11! Eyelids releases a new 7” single, “It’s About to Go Down,” on Feb. 1, and the band is road-testing the new song by playing a few dates on the East Coast. Eyelids grew out of the Portland, Oregon music scene of the mid-1980s, inspired by bands like The Beatles, The Byrds, Big Star, and Kiss. More modern influences included REM, Camper Van Beethoven, Cheap Trick, and Husker Du. Eyelids’ individual members have played with galaxy of bands, including Guided by Voices, Stephen Malkmus, The Decemberists, Elliott Smith, Black Prairie, Loch Lomond, Damien Jurado, and many more. “My first band was Death Midget, then I formed Sprinkler with my brother Nate and we signed with Sub Pop records. I originally wanted to be a film maker; I was going to film school but then we got the offer from Sub Pop and I just signed,” Chris recalled. After a couple albums, Sprinkler ended in 1994, and Chris largely took a break from playing music for a number of years. In 2002, however, he joined Robert Pollard’s Guided By Voices (GBV), eventually recording two albums with GBV. After leaving GBV, Chris played with The Takeovers and Boston Spaceships, both Pollard projects, where Chris met and started playing with John Moen. Their musical sensibilities meshed, as did their songwriting. “Eyelids was the first band where a song I’ve written has a harmony it,” Chris said. Out of that initial jamming, the idea of forming a band began to take shape. Other members, Jonathan Drews (guitar), Jim Talstra (bass), and Paulie Pulvirenti (drums) joined — and an Eyelids identity, and sound, began to take shape. By 2014, Chris and John had written enough songs to record an album that became Eyelids’ debut 854 (Schizophonic Records). Their second album, Or, also on Schizophonic and produced by former REM guitarist Peter Buck, followed in 2017. Maybe More, a limited release (300 CDs, 200 vinyl), appeared in 2018. Although John Moen and Chris share songwriting duties, Chris said, “I can write six or seven good songs, but everybody else will complement them.” The writing partnership with multi-instrumentalist John (baritone sax, guitar, drums) ensures a song will be shaped and molded until it sounds as good as it can… which makes Eyelids’ next project all the more exciting. The resulting album — tentatively titled, The Accidental Falls: The Lyrics of Larry Beckett — and produced by Peter Buck again, doesn’t have a release date yet but should be out later this year. Eyelids have a short tour East coast planned for February 2019 (with hopefully more dates by the summer). Learn more on their website, and see them live at Comet Ping Pong on Monday, Feb. 11.